My People with Blagovesta Gosheva is inspired by family. Document your treasured traditions, gatherings, inside jokes, everyday fun, and making memories with this versatile collection jam packed with family love and happiness. Celebrate your people! and 98 elements. 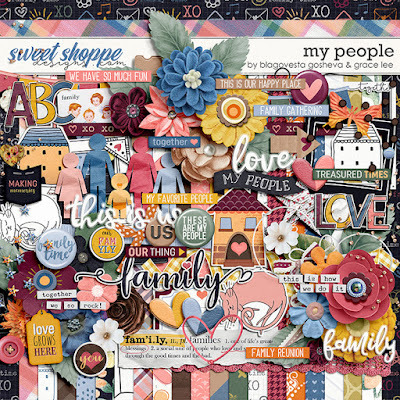 The elements included are: 1 arrow, 3 banners, 2 bows, 2 brads, 1 butterfly, 3 buttons, 2 cats, 1 ephemera, 3 flairs, 16 flowers, 2 foliage, 5 frames, 1 family figures, 3 hearts, 3 houses, 1 journal spot, 8 labels, 2 leaves, 1 overlay, 3 paint, 2 paper pieces, 1 photo corner, 3 ribbons, 3 scatters, 1 scribbles, 1 star, 2 stickers, 3 strings, 2 tags, 3 titles, 1 trim, 8 word art, and 5 word bits.